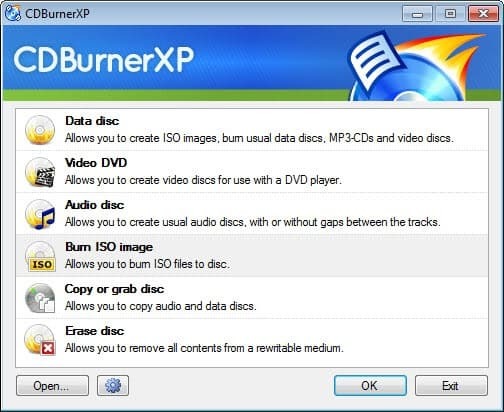 CDBurnerXP is a free disc burning software for Windows that has been around for quite some time. I think I first came into contact with the program when Nero started to add feature after feature to its product which quickly turned from everyone's favorite burning tool to a bloated product. The software supports the operations that you expect a software of its kind to support. You can use it to burn data discs, audio or video CDs and DVDs, burn disc images and some copy related activities as well. CDBurnerXP 4.5 changes the engine used by the program which improves the program's device detection and compatibility. What this means is that errors of the past, like the inability to detect devices on AHCI should be a thing of the past. According to the author, any drive recognition issues should be a thing of the past in this new version. The engine switch should improve the program's startup time, get rid of the 100% cpu usage bug during burning sessions and other issues related to it including improved audio burning which appears to be more reliable in this version. There are a couple of things that I like about the program, including that it is available as a portable version that you do not need to install. The option to download the portable version as a 32-bit or 64-bit download is a bit hidden on the site. When you visit the download page you need to click on the more download options link underneath the download latest version option. This displays a large list of download options including the portable download and one of the installer without the OpenCandy advertising integration. The program itself is lightweight and clutter-less. It displays the available burning options on startup and all you need to do is click on an option to start the job right away. Burning an iso image for instance takes only a couple of clicks. You double-click on the option to select it in the main window, and select the iso file that you want to burn in the new window that opens up. You can make a couple of modifications here on the same page or click on the burn disc button right away to start the burning. Everything is displayed next to each other so that you do not have to click through menus to configure options. There are a couple of things that I'd like to see improved. 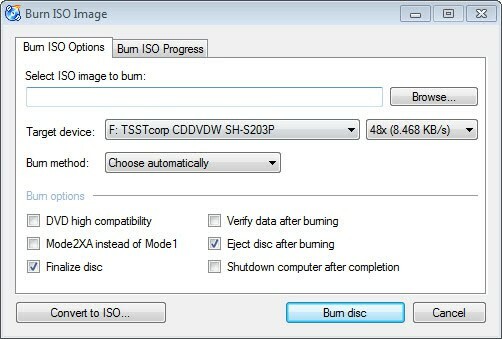 The program supports the direct burning of ISO and MDS disc images, while bin and nrg images need to be converted first using built-in converters before they can be burned. It lacks support for a couple of formats including img. There is also the problem that some modules, like the data or audio burning module, open in their own window. When you close that, the entire program closes down so that you may need to reopen it if you want to burn additional discs. I do not know if this is related to me trying the portable version of the program, or if this is by design. CDBurnerXP is a solid alternative for my favorite ImgBurn. It is definitely a lot easier to use than ImgBurn but lacks some of the features that the latter offers. ImgBurn supports additional disc image formats for instance that this program does not support. All in all though it is a pretty good burning program for the Windows operating system. I’m a CDBurnerXP fan. It’s really a great software, but I had some problem with Windows 7 64 bit, so I use ImgBurner, another great software.. BURN AWARE free is the best alternative. I switched to this program back when Nero went bloated. It still serves me well even today. I haven’t had any compatibilities, detection problems, or crashes. Nice freeware tool, just a kind i needed in my collection, although i liked Nero once now its bloated and BurnAware Home 5.5 and CDBurnerXP 4.5 are just the thing that was needed.